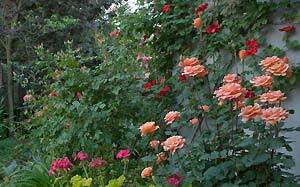 Many gardeners get to the point where they need to seek new locations to grow roses. Once your “rose garden” fills up where do you dig? Consider using the area along fences as another area for you to enjoy your colorful and fragrant collection of flowers. Fences ranging from waist high to tall privacy walls can be a perfect location to add a wall of color in your yard. A wide variety of roses are available, from compact miniatures used as a low border to spacious climbers that spread their color along a span of fence line. When evaluating a location remember to consider how much sun the plants will receive. For example, north facing walls are typically not a good spot due to the lack of sunlight. Also make sure the area will receive the proper amount of water. 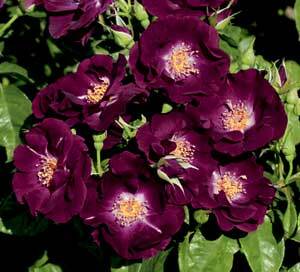 When selecting a rose for a particular area consider the growing habit of the plant. If you have a relatively tall fence or wall and need to cover a 10 to 15 foot span then a climbing rose or a combination of a climber with a few smaller plants is the best choice. 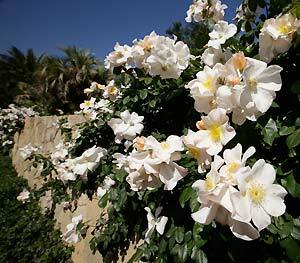 Weeks Roses has several varieties of climbers that have a vigorous growing habit and bloom the first season. The velvety red and white striped Fourth of July, the deep wine purple pedals of Night Owl and the ever-changing colors on Jacob’s Robe are just a few of these climbers. Fence lines offer the opportunity for mass plantings of either a group of the same varieties or a complementary range of colors. A wall of red, pink or golden yellow can enhance the look of your entire yard. The repeat blooming habit of roses paired with rich green, year-round foliage make them an ideal choice for creating an attractive border. Although gardeners may not like the thorny canes on our roses, they do help to create an uninviting barrier when security is needed. By placing a row of roses along a stretch where you would like to deter unwelcome visitors you will create a challenge for even the most persistent trespassers. So when you think you have run out of room in your garden, take a walk along your fences and see if you just might have the perfect area for another rose or two.